Local politicians, residents and community activists alike agree that keeping main thoroughfares, such as Myrtle Avenue in Glendale and Grand Avenue in Maspeth, clean and tidy, is no easy task. But, thanks to Council Member Elizabeth Crowley (D-Middle Village), help is on the way. Crowley secured $61,800 in discretionary funding in this year’s budget to pay for The Doe Fund’s Ready, Willing and Able Program’s street cleaning crews. The crews will pick up trash on Myrtle Avenue from Cooper Avenue to Fresh Pond Road and on Grand Avenue from 61st to 74th Streets, three days a week, until June of next year. The street cleaning program began on Myrtle Avenue July 15 and on Grand Avenue earlier this week. The Doe Fund program’s crews are made up of formerly homeless and/or recently incarcerated men and women undergoing a yearlong program of transitional work, education, housing, and career development. A spokesperson for the Doe Fund said that a four man crew has been assigned to District 30 and on a regular basis, the crews, easily recognized by their trademark blue uniforms, will change as trainees move from street cleaning to their chosen career track in the fund’s program. The organization also said that each day its crews clean about 150 miles of New York City streets. In Queens, the Doe Fund crews currently work in Astoria. In addition, on Tuesday, Councilmember Jimmy Van Bramer announced aggressive street cleaning initiatives involving Doe Fund crews for Long Island City, Dutch Kills and throughout District 26. Vincent Arcuri, chairman of Community Board 5, said that the program is needed. Arcuri said that there were numerous and ongoing complaints from residents along Myrtle Avenue from Fresh Pond Road to Woodhaven Blvd. about debris and garbage being left on street corners and existing litter baskets overflowing due to lack of service. He said that the community board and Council member Crowley have been working with the city’s Department of Sanitation for improved basket pick-up schedules and more enforcement by DOS Police. Crowley called the program a “win-win,” by keeping the community clean while simultaneously providing jobs, education, and career development services for New Yorkers trying to turn their lives around. 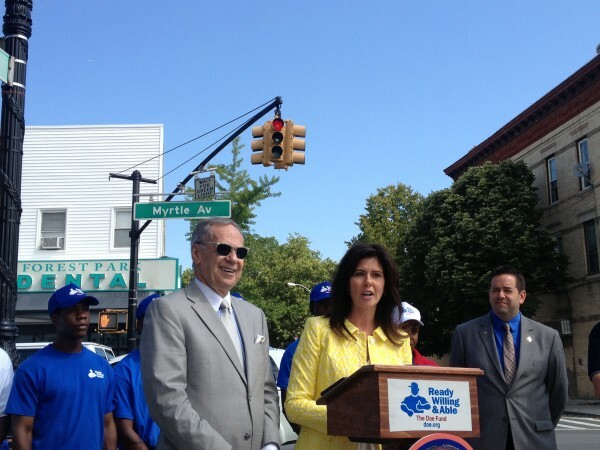 “By choosing the ‘men in blue’ to service Myrtle Avenue and the surrounding area, Ms. Crowley is leading by example, providing our men the opportunity and work they need to transform their lives while improving the cleanliness and safety of the district’s streets”, said George T. McDonald, founder and president of The Doe Fund, in an emailed statement. Roe Daraio, president of COMET or communities of Maspeth and Elmhurst Together, was also pleased about the partnership. “Grand Avenue is an extremely busy commercial strip that is heavily trafficked by pedestrians as well as motorists,” Daraio said. Daraio added that the garbage often blows onto sidewalks and into tree pits. Kathy Masi, a member of the Glendale Civic Association, also praised the partnership.